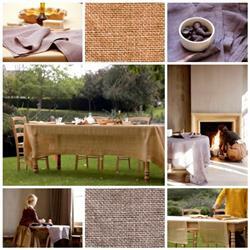 Seductive table linen, splendid in its simplicity and a best seller for several years. Fjord is a fine, luxury table linen finished with a wide mitred hem. A gracefully hanging transparent linen fabric with a truly unique look. Fjord will come into its own on a casual table or one with a more formal setting. Select Table Item napkin runner tablecloth - 69"x108" tablecloth - 69"x128" tablecloth - 69"x145" tablecloth 67" x 67"
Available colors: Flax, Heather, Oyster and Reef Blue. Napkin size 19.5" x 19.5"
Runner size 21" x 59"
The colors Straw - Topaz and Watermelon are no longer available.